For more information or to discuss your individual requirements please contact us, either by calling us or via the form below. Alternatively pop in to see us and we will be more than happy to help. Leave M27 at Junction 8, at roundabout from the East take the 1st exit, from the West take the 3rd exit. Follow to the next roundabout; take the 1st exit A27 sign posted Bursledon. There is a Bates Wharf / Fairline Showroom on the right as you drive in, we are above that and the door is just to the left of their main entrance. Call 07841 659951 (Paul) or 07809 619665 (Vanessa) if you require assistance on the day. As you turn into the boatyard, turn left, go through the big blue gates and park facing the main road, by the river. Nearest British Rail station is Bursledon, which is on the branch line from Southampton to Portsmouth, both of which are served by London Waterloo. 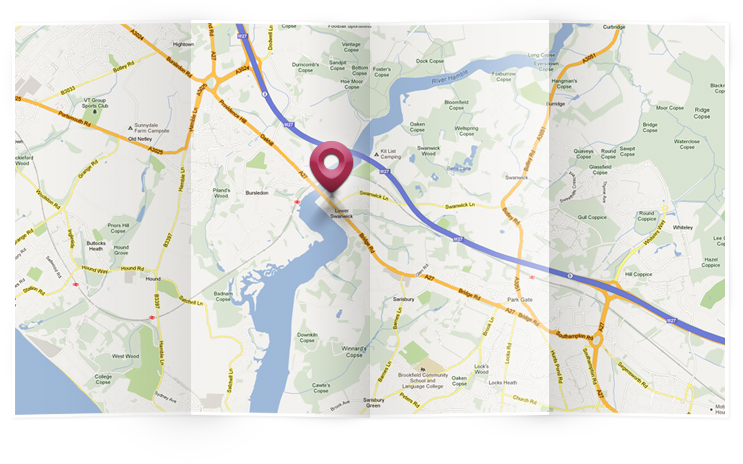 The Training Centre is a five minute walk from Bursledon Station, just walk out of the station car park, turn right to the main road, turn right again and walk under the railway bridge and across the Hamble River bridge, where we are immediately on the left above Fairline Southampton. If you choose to stop at Southampton Central, there are buses from Southampton. Taxi from Southampton Central is about 12 minutes and from Southampton Parkway (Airport) is 15 minutes.